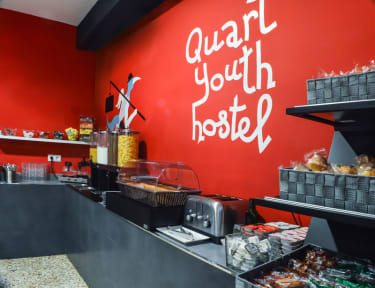 Quart Youth Hostel i Valencia, Spanien : Boka nu! Customers can relax in our dining room while drinking free tea, watch TV or chat. We have a fully equipped kitchen for our guests. They can prepare their own meals. The cafeteria hours are from 7 am to 10.30 pm. The reception will provided free maps, tourist information and tickets for the main attractions of the city. Also hairdryer, Iron, adaptors and towel hire if needed. The access to the building is by card. In Quart Youth Hostel we have private rooms for two, three or four people. There is also beds in rooms shared of six, eight and ten people. 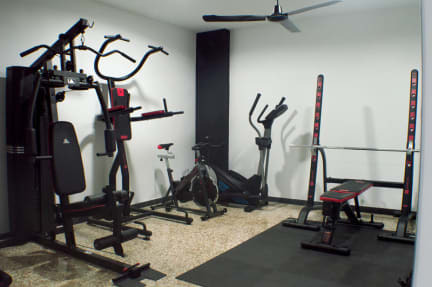 All rooms have individual lockers, ceiling fan, mirror and are equipped with bedding. The private rooms for two and three people also have a desk and towels.